Gibson Performance 2.5 in. Black Exhaust Tip 12.0 in. Long [Gibson 500419-B Exhaust Tip] - $84.95 : 3rd Strike Performance, Your Source for Late Model MOPAR Performance Parts and Accessories! 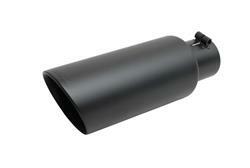 Gibson Elite Black Series exhaust tips will take your tailpipe setup to the next level with attitude and style! These unique add-ons feature a rich matte black ceramic finish with an embossed Gibson logo--and a built-in clampless connection for easy bolt-on without welds. Elite Black Series exhaust tips are constructed from premium T-304 stainless steel for long life and performance. They're produced in a variety of styles and fitments to satisfy the tastes of street machine drivers and show car enthusiasts alike! Tip Outlet Size: 4.0 in. Overall Length (in): 12.000 in.